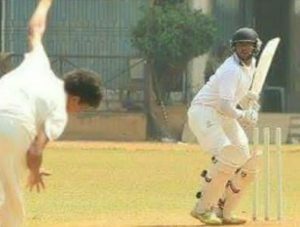 We all know Divyansh who is a consistent top order batsman representing Mumbai team and he also recently came in news for scoring 3tons in just 5 matches at an average of 100+ and a best score of 144*in England. Divyansh is certainly proving a point or two and leaving behind a huge impact on selectors as he is thriving in foreign conditions taking on the English bowlers really well. In the recent match where Dilip Vengsarkar Team were chasing 214runs in 45 overs, the entire team suffered a batting collapse but Divyansh once again stood out like a rock scoring more than 60% of the runs alone. Divyansh scored 80 off 89balls hitting 6fours and a six and became the last man to get out. Divyansh once again showed grit and determination as he did not give up and hardly looked deterred at a time when all the batsman were struggling to score runs even in two digits. Even though Dilip Vengsarkar Team lost the game, once again it was Divyansh turning out to be the bright spot. Aryan Irani with 2wkts and Tanush Kotian with 3wkts bowled well too in that match as the tour progresses while Divyansh keeps on rising!